The East Side Union High School District operates more than thirty (30) school buses each day to carry more than 700 students safely to and from school. Our drivers log more than half a million miles annually, operating in a safe, efficient manner from our district office. The majority of our routes are special education. The remainder of the routes consists of Magnet, Family Learning Center, No Child Left Behind and contract schools. We also provide transportation for outside vendors for field trips. Our department staff consists of twenty-nine(29) bus drivers, one full-time and one part-time dispatcher,one instructor and two mechanics. The California Highway Patrol conducts annual inspections of our driver records, equipment, and inspection of our terminal. They also provide testing for our school bus drivers to keep their certificates updated. 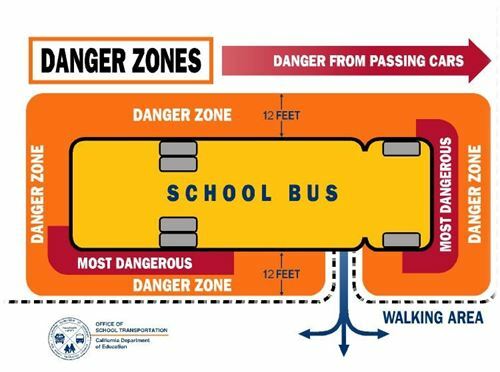 The safety and well being of your child while he or she is riding on a district school bus is the number one priority of the district's Transportation Department. California Law states, "Pupils transported in a school bus shall be under the authority of, and directly to, the driver of the bus. The driver shall be held responsible for the orderly conduct or refusal to submit to the authority of the driver shall be sufficient reason for a pupil to be denied transportation. The driver of a school bus shall not eject any school pupil unless the pupil is given to the custody of a parent or any person designated by the parent or school." "School Bus Drivers Keep Education Rolling"
Please use the procedures and forms listed below when requesting transportation services. When should I stop for the Red Lights on a school bus? Parents are asked to please review the following district bus rules with their child before the start of school. Citations may be issued by the bus driver for any violations of these rules and regulations and a copy of the citation will be sent to the home address of record.